NANONIX specialises in Car Coatings, ranging from the most basic DIY product - Crystal Zeal Real Glass Coating - to the latest most advanced product - NANONIX DIAMOND - , we have different levels of Car Coatings to suit the budget and preference for the wide spectrum of car lovers out there! NANONIX SINGAPORE distributes mainly Nanonix C7 (a hand applied Ceramic 9H Coating) and the top-end flagship Nanonix Diamond (a 2 part air gun spray-on Ceramic 9H Glass Coating) to our approved applicators in Singapore. We also distribute the rest of the Nanonix Products, such as Nanonix Pre Glaze, Nanonix Klear Dark & Light, Nanonix Hydro Coat. Nanonix C7 and DIAMOND have been Tested and Certified by SGS to be 9H Hardness, with DIAMOND being slightly harder than 9H, thus the 9H+ specifications. C7 and DIAMOND features a High Gloss finish, Self Cleaning Properties, Extreme Hydrophobic Effect, Scratch Resistance, Chemical Resistance, UV Resistance, Thermal Resistance and Anti-Grafitti characteristics. Hydrophobic Effect and Anti-Grafitti characteristics will allow the surface coated with C7 or DIAMOND to remain cleaner for a longer period of time! This is because water will bead up and roll away, bringing the dirt and grime with it, thus cleaning the surface of the car panel. 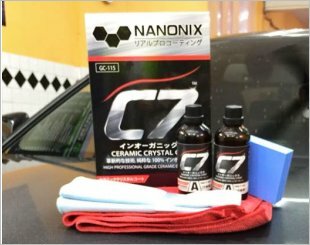 Nanonix C7 and Nanonix DIAMOND will form a permanent bond to the paint work and will not wash away or break down and can only be removed by polishing, thus making it a highly durable protective coating to protect your paintwork for damaging contaminants. Nanonix high professional grade ceramic crystal coat. Make your car shine like crystal glass and supreme protection to paint surface for a long lasting period. A Dual Component Spray Type Coating that is the top end Ceramic 9H Coating from NANONIX! It provides strong shielding protection against UV Rays, Acid Rain,etc.